Hellenic Farms has come up with something truly new and unique, giving you a whole new way to slice and enjoy authentic salami taste and texture with - are you ready for it - Greek figs! That's right, these salamis are made with premium dried Greek figs, Aleppo peppers and dried fruits and nuts, giving you old-world taste and craftsmanship in every bite without the meat or cruelty. With no refrigeration needed, they're GMO-free and made without added sugars, definitely one of the most uniquely delicious vegan meat alternatives that you'll ever try! 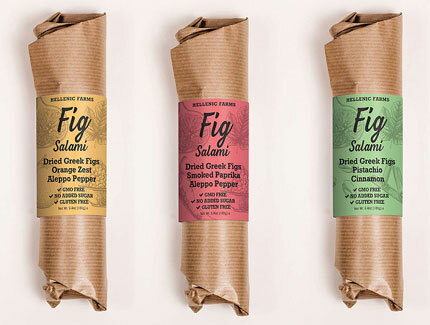 Hellenic Farms Fig Salamis are available in 4 tasty varieties, including Smoked Paprika + Aleppo Pepper, Orange Zest + Aleppo Pepper, Pistachio + Cinnamon, and new Almonds + Black Pepper. All varieties are 6.4 oz. (180g) in size and are $8.99 each. I know it's made from figs, I know I know I know. But this literally tasted like a fruit snack. But like, a not very good fruit snack? Not sure what I was expecting. I did give it to a friend who enjoyed it, so I'm glad it didn't go to waste. From Dara Cunningham of Denver, Colorado on 1/12/2019 . I used to love sausage and had high hopes that this would be a good vegan substitute. Sadly, this is nothing like sausage. It should be called a fig stick - that is what it tastes like. From TJ Dwyer of Saint Paul, Minnesota on 1/8/2019 . I was a bit skeptical. Because, even in the dark ages long ago when I was still eating meat, I didn't eat Salami. But this product is, in a word, "Amazing." It DOES taste like figs and the texture is very figgy. But it's amazing how much it looks and "performs" like hard salami. It's great paired with a cream-style cheese on crackers or pile it on cheese, add some veggies and you've got a great sandwich. I honestly love all 3 flavors but the Pistachio Cinnamon is Heavenly. Side note: When I first read about this product I contacted the manufacturer directly as I was confused about the ingredients. The owner herself got back to me quickly and was very cordial and helpful. Extra credit bonus points! From Ken of Pasadena, California on 11/11/2018 . Does not taste like salami and that's one reason why I love it. It's an original product that is perfect for plant-based hors d'oeuvres. I loved the smoky sweetness of the Smoked Paprika and Aleppo Pepper variety. And I don't have to be reminded of the taste of a dead animal. It's a win-win. From T Benz of Irvine, California on 10/10/2018 . I just sampled the pistachio "salami" at Mother's Market and decided to buy the orange zest salami. I don't believe these were made with the intent to completely replace sausage; but, more like a creative invention in addition to salads, cheese and crackers, etc.